Pastor Samuel Berry III was born on September 1, 1975 to the union of Reverend Samuel Berry Jr & Carolyn Johnson. Samuel was second of three children raised by his parents in the city of Detroit, and was educated in the Detroit Public School System. Samuel graduated from Henry Ford High School. Samuel Berry III accepted his call to preach the gospel, and preached his 1st sermon on September 8, 1991. Samuel Berry attended Henry Ford Community College as well as Davenport University to further his career in Computer Information Systems. Due to Samuels holy conviction, and zeal to excel in ministry he began shifting his focus to courses that pertained to his divine calling. Samuel began attending Greater Ebenezer School of Theological Learning, completing all the required courses to obtain certificates: Systematic Theology, Christian Apologetics, Hermeneutics Homiletics, Teaching Techniques, Understanding Your Bible, Revelation, Old and New Testament Survey and Growing Towards Spiritual Maturity. On September 21, 1996, Samuel made one of the best decisions he could have ever made, He married Lakisha Jackson. Together they have made three awesome contributions to the Kingdom of God and society through Keirstan, Khyla and Kelci. Anointed, Energetic, Radical, Revolutionary and Innovative, he is on the Cutting Edge of “Praise, Worship and Preaching the Word”. Creating an atmosphere for people’s lives to be changed through the power of the Word of God. Immediately after marriage Dr. William H. Murphy Sr., brought Samuel on to the staff of G.E.M.B.C to begin molding him for future opportunities in the ministry. Samuel has served in almost every capacity in the church that can be named. In 1999 after having exemplified the qualifications to be released and sanctioned to perform the sacerdotal duties in the church of the Lord Jesus, Samuel was ordained as an Elder in the Lord’s Church. Even after being ordained Samuel continued to serve faithfully until the Lord would open a door for elevation. In 2003 after much consideration Elder Samuel Berry III, was elected as Senior Pastor of New Corinth Missionary Baptist Church, Detroit MI. When Elder Samuel Berry was appointed as pastor, the church had an active 25 persons who attended the morning worship. During his tenure with New Corinth the church grew rapidly expanding to two locations and two worship services and more than 400 members on role. Pastor Berry saw the need for expansion and growth so he instituted a Christian Education Ministry, Choirs, Deaconess, Ministerial Staff, and much more to further advance the Kingdom of our Lord. Pastor Samuel Berry III has ministered the word for over 25 years. Pastor Berry has pastored in the city of Detroit for more than 13 years. In the year of 2008 Pastor Samuel Berry III, obeyed the voice of God, and returned to Highland Park, MI. and led the congregation through a transition. When the transition was complete they were no longer known as New Corinth, but they would be called Fellowship Institutional Church. Fellowship was originally organized in 1984 by Pastor Samuel Berry Jr. After 7 years the church experienced hard times and dissolved. For 18 years no one was led to finish what God had begun by Pastor Samuel Berry Jr. On August 16th 2008 the Lord spoke to the son, (Samuel Berry III, and said “I have chosen you to complete the task.” On July 5th 2009 Pastor Samuel Berry III, and the church formally known as New Corinth marched into their new facility and renamed the ministry “Fellowship Institutional Church” which was the name of the church when his father pastored. 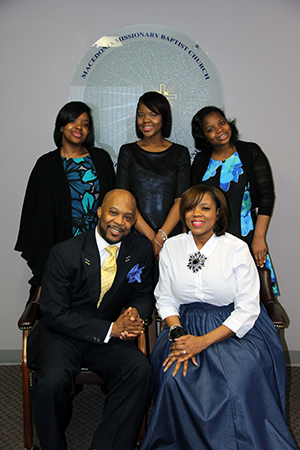 In 2017 The Lord saw fit to relocate Pastor Samuel Berry III and Elder Lakisha Berry to the City of Flint MI. On June 6th 2017 Pastor Samuel Berry III was elected as the 6th Pastor of Macedonia Missionary Baptist Church of Flint MI. As a result of his leadership God is breathing new life into the ministry at Macedonia. The ministry is moving forward to higher heights, in Kingdom building. Pastor Berry currently serves at the helm of the Master’s Touch Community Development Cooperation. Through his leadership the ministry has develop a Isabel presence in the community, partnering with various organizations strengthening the bonds between the local church and the community. Pastor Samuel Berry III is determined to lead people into a consistent relationship with God, and in the presence of God, where their lives can be forever changed for the better. Pastor Berry comes from a long line of Pastors, preachers, and musicians on his father and mothers sides of his family. Some of his ministry accomplishments: Kingdom Praise Live Recording/2011, in which he produced and wrote and arranged over 95% of the music. Greater Ebenezer Live Recording/2000. Pastor Samuel Berry has written for some of Gospel Music’s Top Artist. Pastor Berry has tapped into the heart of God arranging, and writing many songs, that express the heart of God, and his love for God. Pastor believes that there is a sound in the presence of God that must be released through melodic form to set the captives free. Pastor Samuel & Lady Lakisha Berry are the founders of Samuel Berry III Ministries which is a Ministry based organization, whose mission is to minister the word in an illustrative format, training worship leaders and worship teams on the proper order of worship as well as community service, aiding those who are need. Pastor Samuel Berry works in ministry with his wife First Lady, Elder Lakisha Berry as she is affectionately called has an extreme love for God, and his people. Her love for God is displayed through her work in the Kingdom Kidz (Children’s Ministry), (Women‘ Ministry) and through her soft angelic voice in song, during the Praise & Worship. Lady Berry is anointed by God to be a wife, mother and friend, and one of God’s leading ladies in this end time. Pastor Berry is currently in pursuit of his Bachelors Degree, and working on His first book.